"I remember what it felt like to set the fires. It felt good. All of us had grown up powerless, reminded over and over that we were dirty, broken dolls that should be grateful to be played with by God's hand. We were to withdraw from the world, to barricade ourselves in our homes and wait patiently for God to pull the plug, and if we emerged it should be for one reason: to drag others in. The fires changed everything. We were no longer refugees; we were warriors..."~ Isaac Marion, The Living. 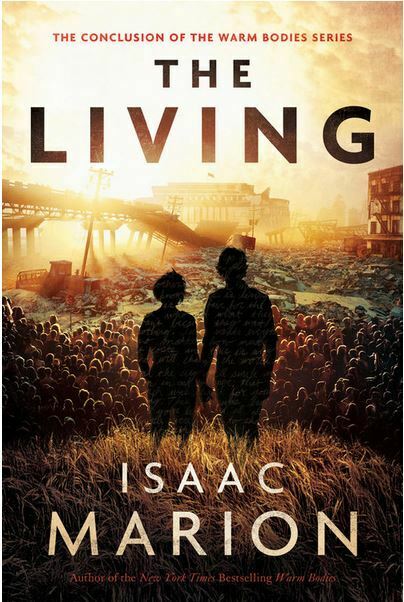 The Living is the thrilling conclusion to the New York Times bestselling Warm Bodies series. Warning- if you haven't read the previous books, this review will contain spoilers. Then again, if you haven't read the previous books, this one really won't make any sense to you anyway. Go back and read them from the beginning, preferably back to back. Trust me, it'll be worth it. In the story so far, R was a zombie who gradually came back to life to be with Julie, a survivor whom he recognised from fragments of memory he gained after eating her boyfriend, Perry. Together, Julie and R show survivors that there are more possibilities left in the world than just killing or hiding from the dead. When the Axiom group, a corporation bent on taking over what remains of America, came to take over the stadium where Julie and R had made their home, they fled across the country. Along the way, they met Abram, a former Axiom employee, his young daughter Sprout, and were reunited their friends Nora and Marcus, R's 'children', Alex and Joan and Julie's long dead mother. They also met H. Tomsen, creator of the Exed World Almanac, who is on a mission to destroy Babel, the jammer that prevents ordinary people from being able to communicate across the country. Thomson believes that once the jammer is destroyed, humanity will finally have a shot at building a new society. Meanwhile, R has started to regain his memories from his first life, before he became a zombie. Will Julie understand the terrible things he did in that time before, without the excuse of the plague? Can he even forgive himself? Isaac Marion's writing is beautiful, even poetic at times, which really lets you feel both the horror of the apocalypse as well as Marion's idealism and hope. This book is not really about zombies, to the extent that I had forgotten that they were a threat to humans until about halfway through it because that aspect of things hadn't been in the foreground for a while. There are gruesome and scary moments, but overall it's more about R's journey to try and be a good man and reconcile with the sins of his past. It's also a love story, with his relationship with Julie once again helping keep R in the land of the living. The author also finally starts to get into the why of the zombie plague, and the supernatural element makes a change from the many recent zombie stories that involve more worldly explanations like viruses. There's also some speculation about what makes a successful society and to what extent people can, or should, trust one another, which leaves the reader with plenty to think about. While I'm sorry my journey with these characters has come to an end, at least it was a good ending. The Living is a fitting conclusion to an unusual series full of love, death, redemption and some pretty inventive swearing. It will probably appeal to people who liked the British TV series In the Flesh. Disclaimer: I received a complimentary copy of this book from Zola books, via NetGalley, in exchange for an honest review.